Anna of Too Many Annas had written an RP post some time ago, a brief interlude into the lives of Aely and Arrens. It took place during Winter’s Veil. I had sketched a scene from that post some time ago. Since Winter has decided it wanted to see what April was like (hint: if Winter is there, it still looks like winter), I think that it makes a fitting tribute as today’s Saturday Sketch. But to fully appreciate the scene, you should first read Anna’s Winter’s Veil post. No? But I supplied a link and everything. Have you read it now? … Well, I guess I’ll have to assume you did, as the image I drew is now right below this line (and you probably already saw it anyway). (You may click the image to embiggen). As soon as I read the post, I had this image in my mind (only better drawn and more funny). So I sketched it (in PEN!) on a nearby sheet of paper. That I then scanned (and removed some stray pen lines). Still, I don’t think it was too bad. Have you ever read a passage that gave you an excellent mental image of what was going on? Have you ever illustrated such a passage before? And, most importantly, have you ever been unexpected beaned in the head by a snowball? Let me know in the comments! Remember those drawings I hastily posted a little while ago? And how I said I was going to describe them and then didn’t post for awhile? Well, I finally finished it, which you are now reading, in all of it’s descriptive glory. In the future, I hope to do the posting of the picture and describing them in one post. It wouldn’t be that hard- I just need to not leave 15 minutes after I start putting together a post. And now onwards to the part where I talk about this art in particular! This set of images I sketched out in pen one night in front of my computer. You see, it was the Wildfire/Stormwind University unofficial RP night at the Pig & Whistle in Stormwind, and I was standing around in there trying to follow all the RP threads going on, when suddenly I had an urge to draw. 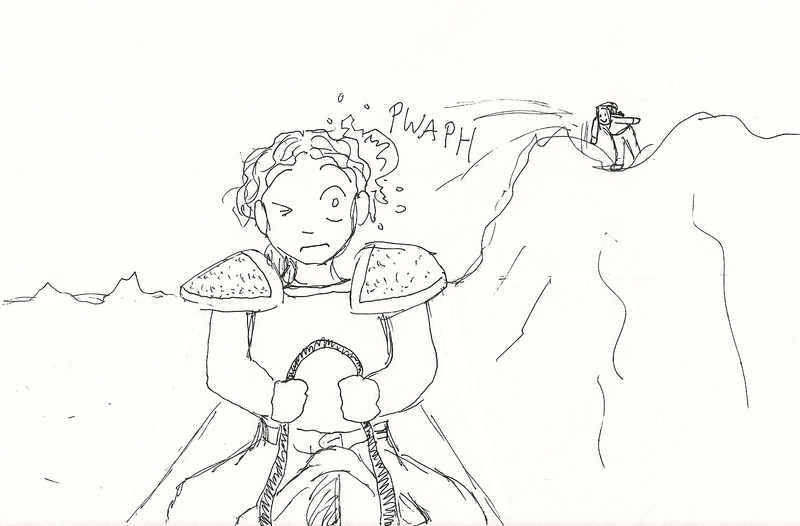 And so I did (though I had to stop for a bit when Chaanii and Kalenedral came over to RP with me, which I didn’t notice at first because I was drawing. Whoops!). I used the in-game character models as references (with a little help from the armory later, since I didn’t remember all the color information). I drew them in this order: Aely, Chaanii, Kalenedral, and Loreli. 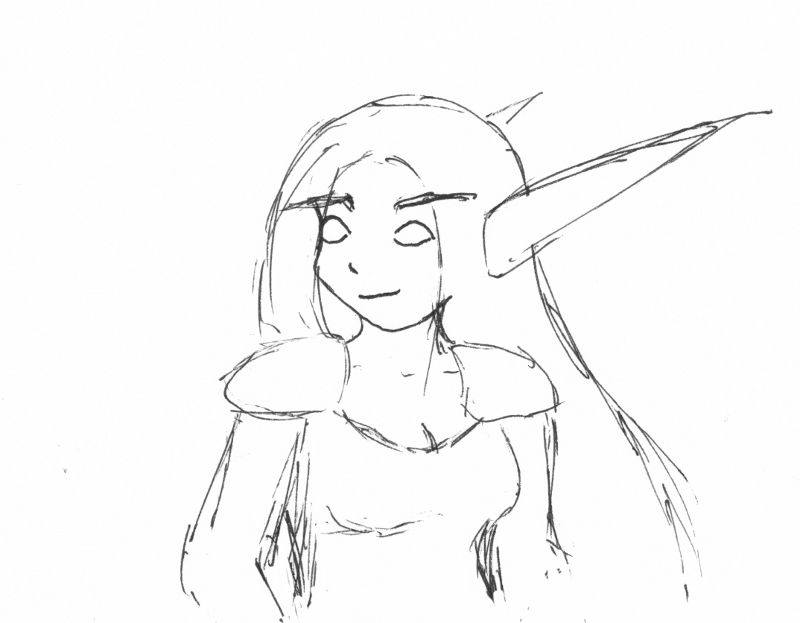 I hadn’t planned on sketching more than Aely at first, but then I was still in a drawing mood, and Chaanii and Kal were right there, so it was an obvious next step. However, the order would explain why some of them seem to be of a higher quality (because late night + drawing = lazy, messy sketches). Anyway, after I had finished drawing them with ink, on real live paper… I went to bed. XD However, the next night I scanned them onto my computer (otherwise it would be pretty hard to share the pictures with everyone else). And then I edited them with the Photoshop-esque program of Gimp. It works pretty well for being free, but it has some quirks I’m not a fan of (I’m stuck using it until I get some license error figured out, and to do that I need all of the installation discs… unfortunately I lost one of them!). I got rid of some of the most grievous line errors, as sketches are prone to having lots of bad lines. So the black and white sketches you see are not actually the original, but nicer than the origial (if you can believe that!). I then decided to color them, because it’s really hard to tell what’s going on with Aely’s shirt(s) otherwise; and if I color one, I must color them all! However, I ended doing this pretty late into the night, so my coloring got worse and worse. I mean… it got artistically sketchy. Yes, that’s it. Anyway, time to blather about each drawing specifically! 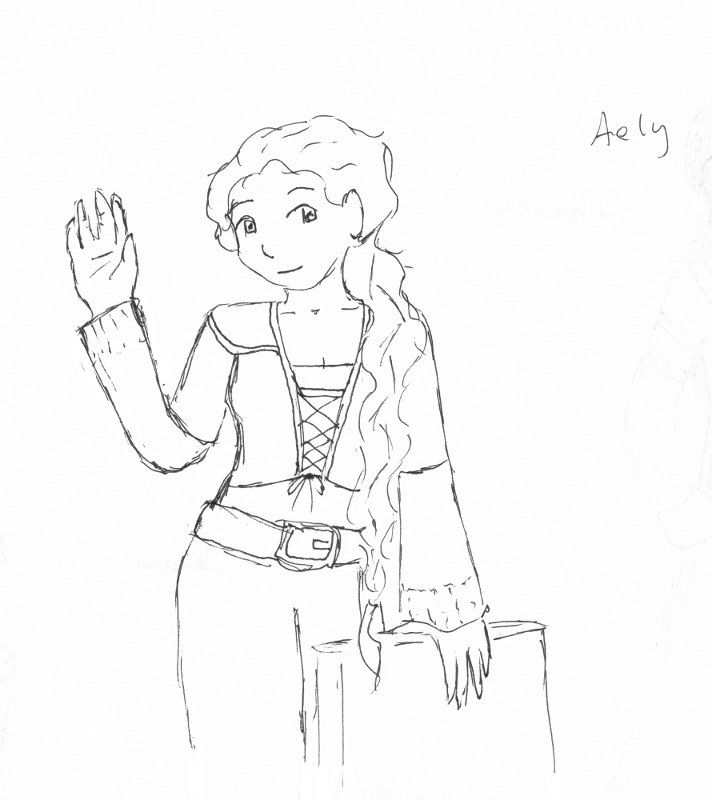 The first sketch I did was of Aely, aka Anna, from Too Many Annas (in case you didn’t know that). I believe she was RPing elsewhere in the Pig & Whistle while I sketched her, without her knowing that I was sketching her. I had been admiring her outfit for a little bit (I have yet to get any RP outfits on my toons… yet), and the empty sheet of paper in front of me said ‘start drawing!’ The pose I decided on because in-game she had just stood up and leaned on a chair (via emotes), so I settled on that for her pose. … Yes, that is a chair her hand is on. You’ll just have to use your imagination to fill out the rest of it. Now, she probably wouldn’t have been waving while leaning on the chair in-game, but I had already sketched out most of her body before figuring out the chair placement. Posing people in drawings is something I find difficult. Partly because it’s hard to come up with unique poses (“Now stare at the camera facing this way! Now turn slightly and stare at the camera that way!”), and partly because I hate drawing hands. And unfortunately for me, hands are an integral of people. Usually I just draw round balls in place of hands, but while drawing that night I thought I should at least make an effort. In the end I don’t think these hands turned out too bad (though the spacing between fingers is exaggerated, to be sure), especially considering I was drawing in pen! I also colored this sketch first. As you can probably tell, this one’s colors look light and pale compared to the other ones. That’s due to my coloring technique – I was using brushes at ~60% opacity. That means the brush color was transparent, which in turn makes the colors lighter. Usually when I use transparent brushes, it makes it easy to blend colors together (since the ‘canvas’ isn’t saturated with just one color, when you put another color on top, it creates a blended color right away, which is easily blurred with the surrounding colors). And blended colors gives a more polished look, I think. However, I have usually used this technique in the past in Photoshop, where it works wonderfully. However, I’m not using Photoshop right now (due to a bug on their end that invalidates the license, which I still need to figure out how to fix! *fume, fume*); instead, I’m using Gimp, a free program that works pretty much like Photoshop does. If you can’t afford to get Photoshop, then Gimp is a decent alternative. However, it still isn’t exactly like Photoshop. There are subtle differences… such as the one that gave me such trouble coloring this picture! Because of all that trouble with using multiple coloring layers and transparencies, I decided to save myself the headache for the later pictures and not use transparencies while drawing them. Using solid colors makes it easier, even if it doesn’t look as light and fluffy. 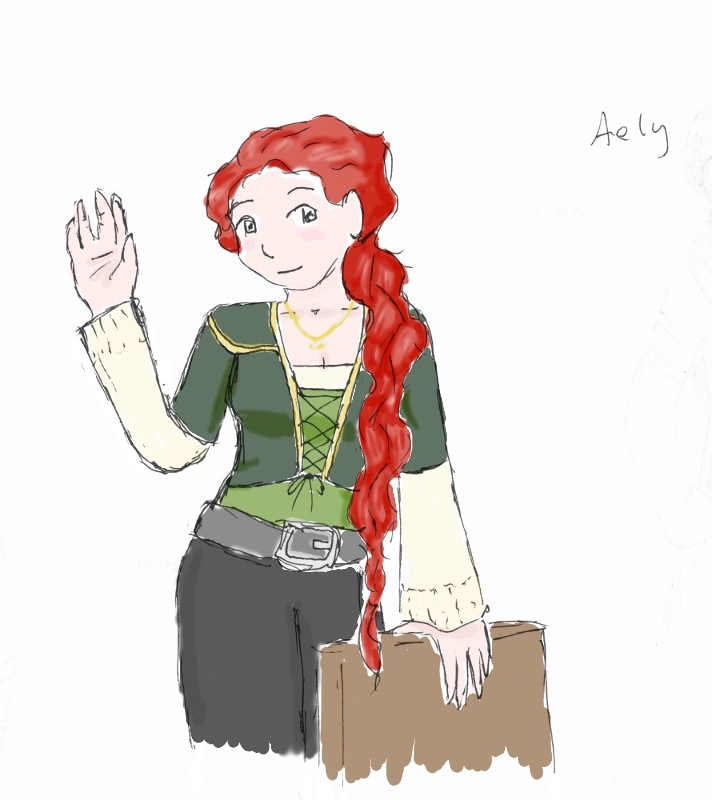 … And to mention the actual drawing for this section once more before moving on, I’ll note that I forgot to sketch Aely’s necklace, that’s mentioned in her FlagRSP* description. Now, I went back and read the description, and unfortunately I wasn’t too sure how it was shaped. However, I felt I should add something, so before I went to bed the night I colored all of these, I quickly added a necklace… with solid colors, instead of using transparent ones. So if it looks out of place, that’s why. *FlagRSP is a addon for WoW that folks can use to add a description to their character, as well as other ‘metadata’ information, such as their RP level experience and if they’re looking for contact. I know that Anna has written about it before, and if you’re interested in RP, you should consider checking it out. Since I had already sketched Aely, I offered to draw my conversation partners, Chaanii and Kalenedral. They both agreed, but Chaanii said yes first so I drew her first. It took me two attempts to get something I was pleased with, though. I wasn’t happy with the first sketch for several reasons. Her head seems too large, and I didn’t like the pose – her dress just makes it seem more awkward (I will admit, the dress was very complicated; I had to dumb it down a lot so I could actually draw it!) Plus I felt a little guilty for trying to think of a pose that would hide her hands as much as possible. I was trying to come up with a creative type of pose, but in the end it didn’t work out. The second sketch I whipped out in at least half the time, and I think it looks much better. No creative pose here; just a plain ‘look at the camera and smile’ look. Sure, I still copped out when it came to her hands, and you wouldn’t guess for just one minute that she was in a bar… but doesn’t she look cute? This was the first one I colored without using a transparent brush. You can see that the shading lines are much harsher, since it didn’t blur well. So now you all know that I typically scribble when I draw. I tried giving her a little blush, but I couldn’t get the color quite right, so that’s what’s with the darker spots on her face that I was too lazy to try and ‘correct’. I mean… I totally meant to do it that way. >.> Also, that stuff on her neck is supposed to be scarring from magic, a detail I read in her FlagRSP note (I had to guess about what, exactly, magical scarring looks like). 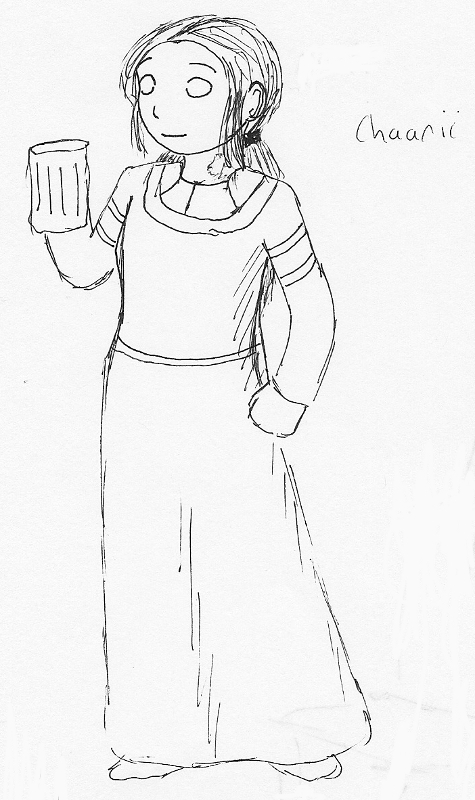 Fun fact about her outfit: While I did dumb down the dress design, I did notice while drawing it that the sleeves were the exactly the same as Aely’s shirt sleeves. Oh game designers and your blatant model reuse. This was the third one I drew. It was getting pretty late (for me) so my sketching got a little sloppy. 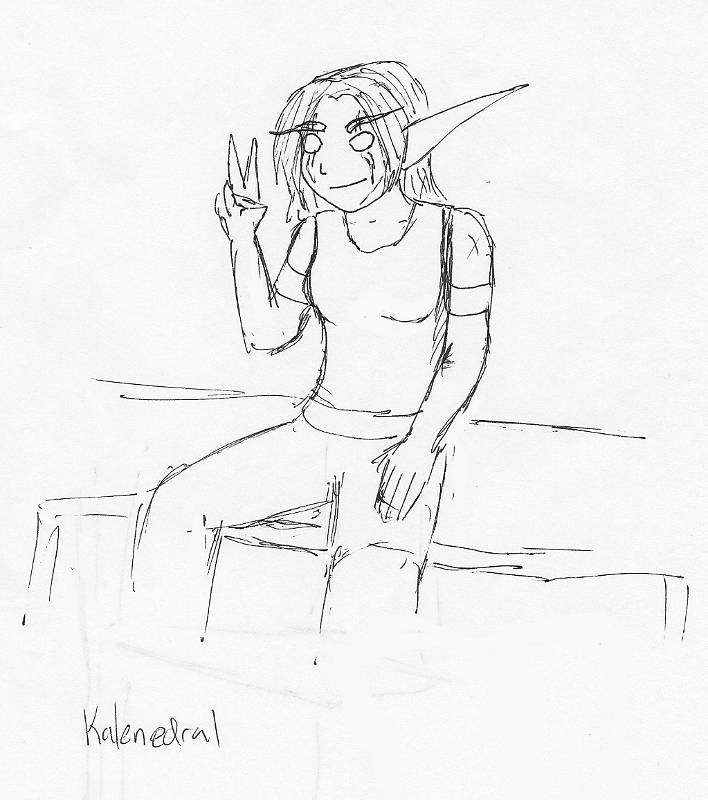 I was fretting about giving her a pose, as well, so that’s why I settled on the standard anime ‘victory’ sign, which is one of the few hand poses I’m actually okay at drawing. I also think the sitting pose isn’t that bad, considering I usually don’t use references (and it was in pen!) And yes, that is a bench she’s sitting on, not just some random lines… it looked clearer on paper, but it got too sketchy further down so I decided to crop it farther up. You’ll note that there are a few extra lines here and there on her skin; those are supposed to be scars, as per her FlagRSP description. I tried to make sure to get the one on her face, as that was one that was called out specifically. And because Kal’s description sounded more ‘rough and tumble’ than the other ladies I drew… I think she sort of ended up looking like a guy! And that’s after I exclaimed that I couldn’t draw guys! (Which is pretty much true; all the guys I draw end up looking like girls…) It could just be me, though. What do you think? When I was coloring this one, it was even later than when I was drawing it. And after I had colored in the skin, I realized I didn’t remember what color Kal’s hair was! Luckily, the armory conveniently posts character models, so I went to check her’s out – only to find it was down for maintenance! Weeping silently*, I gave up in frustration and colored everything anyway. 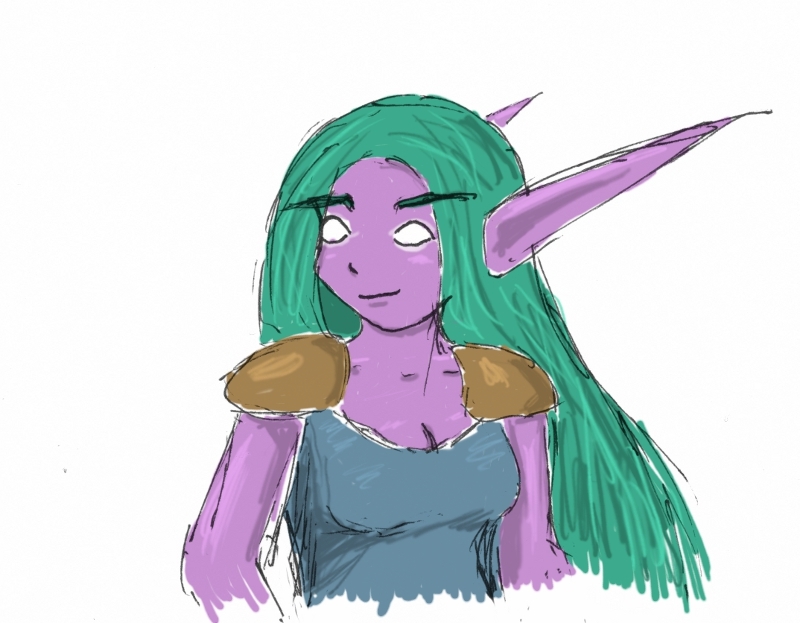 First I colored the skin and eyes, because those are pretty much the same for most Night Elves (or at least that’s what I thought at the time; I know now that Night Elf skin has a greater variance than one would think). And then I colored the clothing, as I guessed they were some kind of ‘brown’. Since the armory still wasn’t up, I ended up ‘finishing’ the drawing by coloring her hair blue, as for some reason I thought that was the correct color. I then moved on to color Loreli’s picture. During that time, the armory had come back online! I used it to reference colors for Loreli, and then I went back to check on Kalenedral’s hair color… to find out I was completely wrong! Kal’s hair color was the same as Loreli’s, a nice teal-green, so I had to go back and color over the blue hair. Fortunately, I had prepared for such an occurrence, so I still had to file saved in layers, instead of combining it into a single flat jpg image. Loreli was the last character I sketched, and that was on a whim. I’ve read some of her fic before on Arren’s site, and she was just sitting across the way in the Pig & Whistle, so it was easy enough to run over to her side and sketch her quick before going to bed (since my previous RP conversation with Chaanii and Kalenedral had died out). However, I did a really… lazy… sketch of her. The lower two-thirds or so doesn’t look very nice at all; it’s very sketchy, and certainly didn’t capture Loreli’s aura of sexiness that I think she usually carries around with her (at least according to the pictures I’ve seen Loreli draw of her character; see the third one down in this post). That’s what happens when you try to draw fast in order to go to bed. Eventually I gave up on trying to fix my anatomical nightmare and went to bed anyway. When I was scanning in the pictures, I almost didn’t scan this one. However, everything is solved by cropping out the bad bits! That’s why her picture is a headshot while everyone else has more or less a full body. I ended up coloring this sketch third (or maybe third and a half or so), even though I drew it last, because of that whole forgetting what Kal looked like thing. However, because of the various pictures of Lor, I could pinpoint her looks, more or less. And it was actually part way through coloring her that the armory went back online. I then referenced her clothing and skin from there. 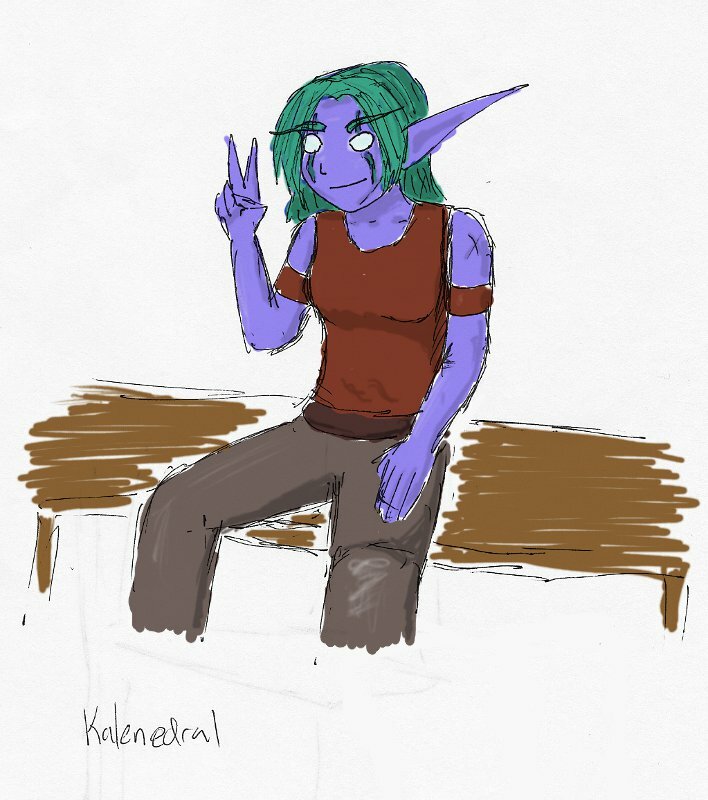 Night Elf skin, in some cases, is much more pink than purple than you would think (at least her’s and Kal’s were. I think I usually pick a more blue/purple skin for my Night Elves, though). Since I had looked at the armory for Loreli’s skin but not Kal’s, Kal’s skin is much more purple, even though it should have been more pink. However, I didn’t want to recolor that too. I rather like the sketchiness of the coloring job on this one; while it isn’t as smooth as it could be, the colors fill in nicely and it gives it a nice vibe. Maybe it’s because it’s a zoomed in shot compared to the others, which makes it stand out more. (I almost typed ‘more different’ there. I r teh good at english). And I haven’t drawn anything besides doodles recently. (I really should; I’m getting behind on my supposed ‘summer get-ahead’ schedule for my comic). Maybe I’ll start showing off some of the random doodles I make at work and home. But I promise to write less when I do! So, before I frantically pack and leave for an anime convention (whoo hoo! ), I’d like to share something with you, dear Interwebs. As you may or may not know, I like to draw. Now, I’m not really trained or anything – I’ve only taken drawing classes in high school and a single one in college. My style is definitely anime-ish. I even have a gig drawing comics for a college newspaper, which is pretty neat. 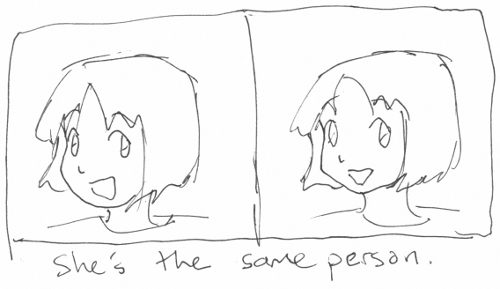 Unfortunately, I’m apparently unable to draw the same character twice looking exactly the same. It’s probably because I’m lazy. Anyway, to cut a long story even shorter, a couple of days ago I got a little bored in-game whilest on Feathermoon, and started sketching (in pen) some of the characters around me. Eventually I had to stop because apparently they were trying to talk to me while I was afk drawing, but whatever. So below are the sketches, scanned with a little digital retouching, as well as a color version I drew on the computer. I’ll talk about them more later- for now I gotta run! See ya! I didn’t like this one as much, so I tried again with better results, I think.